How Can I Go Bed and Breakfast on Tiffany Hill? 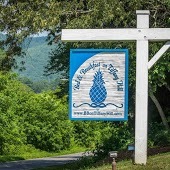 Where is Bed and Breakfast on Tiffany Hill in Mills River on the Map? My wife and I recently spent a weekend here and really enjoyed our stay! The accommodations were very modern and the staff was very professional and friendly. Having a 3-course breakfast with the other guests while sharing our experiences with the local attractions was a nice way to start the day. I highly recommend them! Selena makes you feel right at home. Every room is impeccably decorated, clean, cozy and comfortable. What a great place to relax and from which you canenjoy the WNC scenery and culture! I highly recommend it. This is the first time we have stayed at a bed and breakfast and I must say it was one of the most amazing experiences ever! My daughter and her now husband stayed at Tiffany Hill a few years ago and told me that when she married, this is where she wanted the ceremony to be. The grounds are so beautiful and serene, and I don't want to forget to mention the 3 course breakfast ending with "a little bit of dessert"! :-) The hospitality and attention to detail makes this B&B stand out from the rest! Selena makes sure that all her guests have what they need and is always willing to go over and above to make sure their stay is one of the most memorable ones ever! When at the B&B, make sure you drive the Blue Ridge Parkway, visit the many waterfalls and plan a visit to the Biltmore House. In addition to what was mentioned, make sure you save time to walk the beautiful grounds on the property. We were also fortunate enough to see the magic of the fireflies and have pictures of the bride and groom with the fireflies in the background! Do not hesitate to stay at Tiffany Hill as you will not be disappointed! What an amazing place for a wedding!!! Absolutely one of the best things I do for myself from time to time is to stay at Tiffany Hill!! Selena and her staff treat every guest as though they are the favorite! No detail is overlooked in making the Tiffany Hill experience a treasure! We went here for our anniversary and they aim to please I tell you. We tried the SeaSide and Charlottesville Suites and loved both of them. I would go there again and try the other rooms as well. They lit candles for us at breakfast to celebrate our anniversary. They serve an amazing 3 course breakfast and Selena the innkeeper is really AWESOME. They along with my husband surprised me so well for our anniversary, it was beyond my imagination. I was treated very special and thoroughly enjoyed our experience. I would highly recommend this place.